Every year brings its round of anniversaries, commemorations and jubilees. 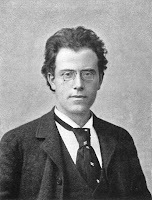 When it comes to composers, 2010 is the year of Gustav Mahler, whose 150th birthday falls on 18 May. Mahler' breakthrough is one of the biggest stories of the last sixty years in music history. Certainly if you compare concert programs of the pre-World War II era with those of the period since 1945 the name that has gone from to obscurity to omnipresence is that of this Austrian symphonist whose greatest works come from an intensive twenty-year period between about 1890 and his death in 1911 at the age of just 51. Mahler was better known as a conductor than as a composer during his lifetime but once famously pedricted that his "time would come". Posterity has proven him right. There is a hardly a concert season of a major orchestra any where in the world that does not include at least one of Mahler's symphonies even though most of them are large and expensive to perform. They are very popular among conductors and the recording industry has also taken to his music with great enthusuiasm. Probably only the symphonies of Beethoven are a more popular subject for complete cycles released as boxed sets. Mahler's Jewish heritage (he converted to Catholicism in his 40s) certainly held his music back during the 1930s and his breakthrough also owes a lot to the efforts of conductors such as Leonard Bernstein, Bruno Walter and Bernhard Haitink. But there efforts alone do not explain the way in which Mahler' music has struck a nerve in the post-World War II era. Mahler's ability to combine the banal with faith in the creation of a better world reflects the schizoid dreams of the post-Auschwitz world. His mixture of the bitter and the almost unbearably sweet somehow speaks to a world that enjoys unprecedented levels of technological progress and comfort while living with an equally unparralleled risk of nuclear obliteration. The sheer size and ambition of his music certainly fits well with the event culture of today's music life. Maybe, as with all great music, there is something in Mahler's that helps it speak to so many people, something that cannot be adequately captured in words, something inherently musical and perhaps even timeless, almost 150 years after his birthday.